You may recall the article we did last year about the railings and footrests for cyclists here in Copenhagen. The pilot project has proved so successful that the City of Copenhagen's Bicycle Office is now placing 20 more around the city to add to the existing five. For no reason other than spoiling our cyclists and to thank them for cycling in the city. 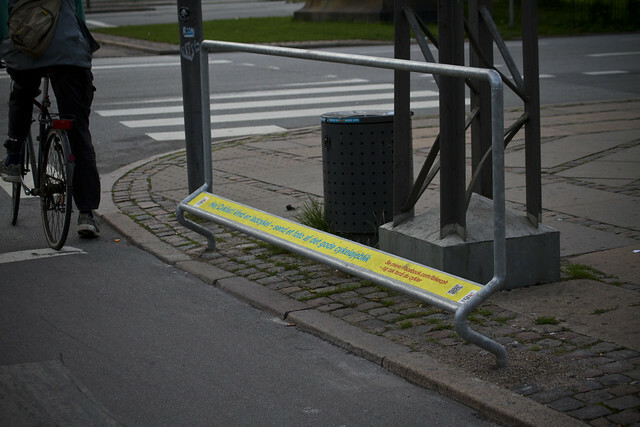 The footrests all feature the "Hej Cyklist" campaign that Copenhagenize Consulting developed for the Bicycle Office. Simple, friendly and encouraging texts like "Hi, cyclist! Rest your foot here and thanks for cycling in the city". I spotted one of the new ones the other day, pictured above. It reads, "Win a cargo bike. Send in a photo of a lovely bicycle moment". The 20 new cyclist railings and footrests cost 187,000 kroner ($36,000). A small price to pay to spoil our cycling citizens and make their everyday cycling life just a little bit easier, if only for a moment or two.